Other notable features for the 100RT include Link-Belt’s latest operator cab design, Pulse 2.0 operating system with remote software updates via Wi-Fi, V-Calc asymmetrical outrigger options, a new simple-to-assemble fly, latest Cummins technology with a Stage V engine, and Link-Belt’s Vision package. 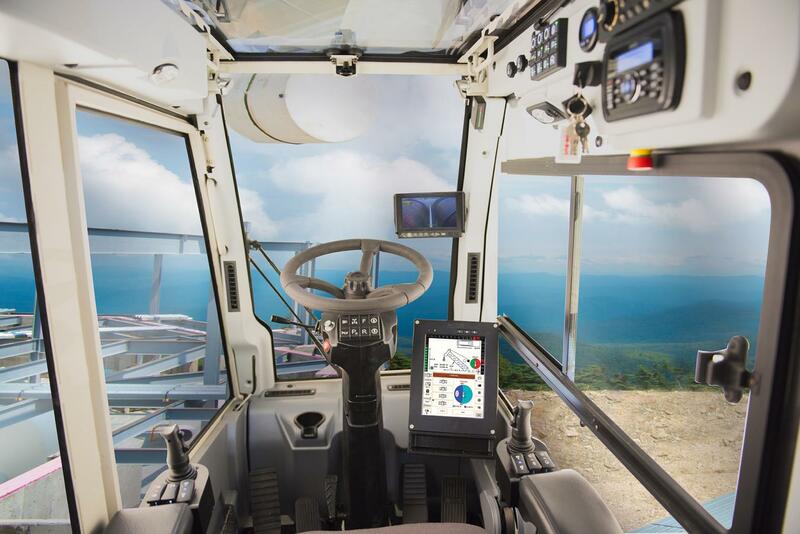 Following rigorous on-site and field testing, shipments of the new 100-ton (90-mt) 100RT rough terrain crane are scheduled to begin first quarter 2019. The 100RT delivers outstanding reach with a five-section 40.6 - 155 ft. (12.3 – 47.2 m) full-power formed boom, built to Link-Belt’s specific boom profile and tolerances at their Lexington, Kentucky campus. An available two-piece [35 - 58 ft. (10.7 – 17.7 m)] on-board offsettable fly provides greater flexibility and range, and manually offsets at 2, 15, 30 and 45 degrees. A 16 ft. (4.9 m) lattice insert extension provides a maximum tip height of 237 ft. (72.2 m). 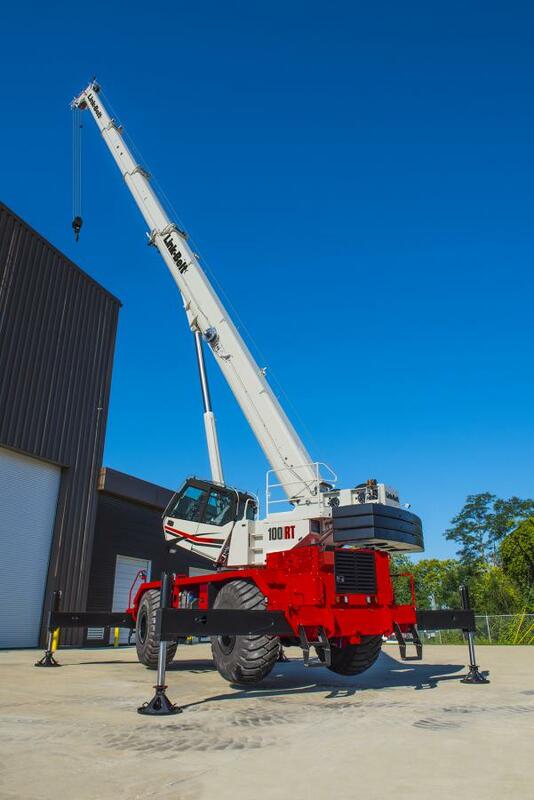 The 100RT will be the first Link-Belt rough terrain crane to utilize the new fly erection technology from Link-Belt’s latest telescopic truck and telescopic crawler cranes. A fly assist cylinder makes erecting and stowing the fly a one-person operation and minimizes work at height. Boom head speed screws and numbered spring loaded latches provide intuitive assembly. Given the natural elevation of a rough terrain crane boom, Link-Belt has simplified fly assembly with new ground level carrier controls. One control raises and lowers boom angle from 0 to -3 degrees, and another control is used for the fly assist cylinder. The 100RT’s six-speed transmission is powered by a Cummins Stage V QSB 6.7L 232 hp (173 kW) diesel engine which is dual compliant for both Tier IV and Stage V standards. Four 29.5x25 tires mounted on axles affixed to the carrier via greaseless 4-link suspension, eliminating ten previous grease points. Centralized electrical locations, remote mounted filters, and easy-access fluid checks make routine service a breeze. A 24-volt electrical system makes running diagnostics quicker and easier. The wiring is a Controller Area Network (CAN bus) system. The 24-volt system yields the ability to multiplex with modules placed near dedicated functions like outrigger beams and winches. In total, there are five modules located throughout the machine that allow crane functions to continue working in instances where other modules are being diagnosed or serviced. Six points of access to the carrier deck are maintained with new ergonomic ladders, and regardless of slew angle, the operator has easy egress to the flat deck from the cab. The 100RT exterior features all new durable “tough skin” paint, along with a new slip-resistant paint on the carrier deck to provide better footing for access and egress. 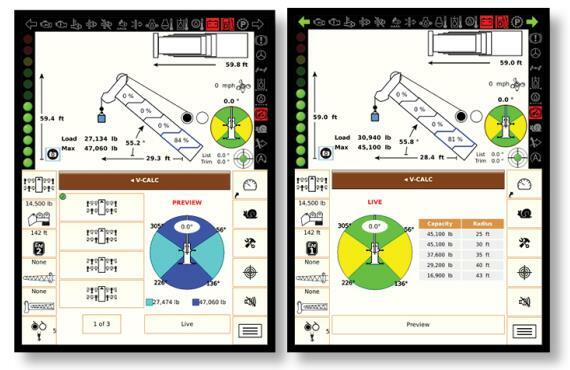 Upon selection, Link-Belt Pulse 2.0 provides a live view of the working area with color-coded quadrants. If the chart exceeds capacity at a given slew angle, swing arrest will initiate five degrees prior-- allowing the crane to come to a smooth stop. High strength steel used in the upper frame accommodates a new winch design with ultra-wide drums for increased line pull at higher working layers. Maximum winch line pull of 23,632 lbs. (105.1 kN) provides a wider range of applications and contractor needs. 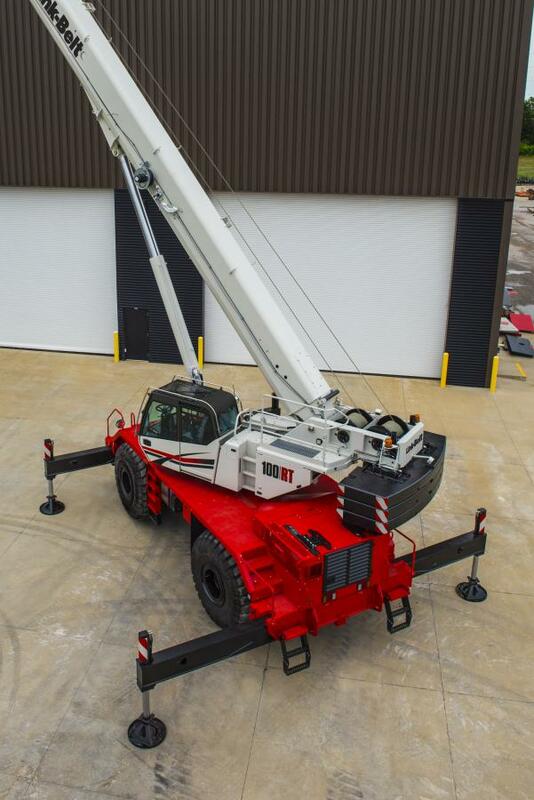 Hydraulic outboard routings and wiring harness improvements offer form-fitted design, providing greater serviceability over the life of the crane. Three slabs of removable upper counterweight totaling 28,800 lbs. (13.2-mt) is standard equipment. Link-Belt carefully considers the location of swing out engine access doors and centralized electrical locations – keeping them accessible from the ground or near a grab handle or ladder. Transmission oil, engine oil, primary and secondary fuel filters, as well as the engine oil filter are mounted for easy reach. Link-Belt’s camera vision package on the 100RT enhances on-board site monitoring and includes a back-up camera, as well as cameras for viewing winches and the right side of the upper. 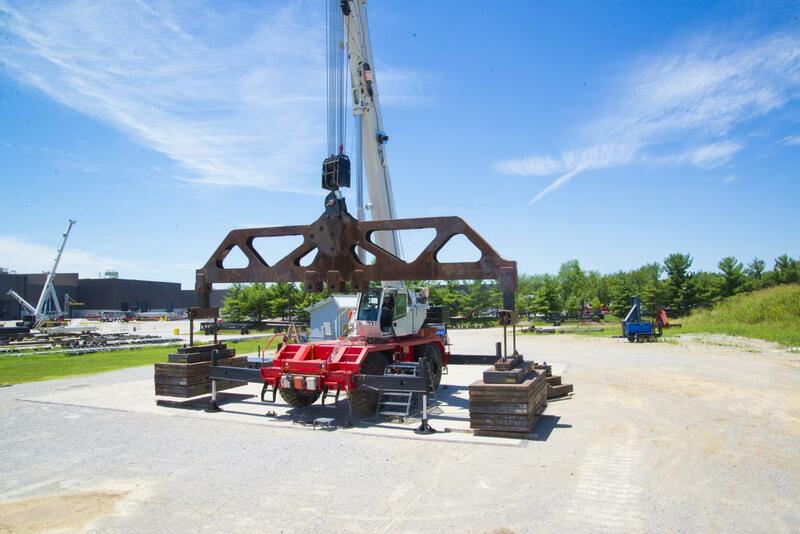 The 100RT will transport with base unit fully equipped minus modular counterweights at 92,859 lbs. (42 120.1 kg). With an overall height of 12 ft. 10 in. (3.91 m) this rough terrain can be driven right off a conventional lowboy trailer, assemble counterweight and be ready to go to work!